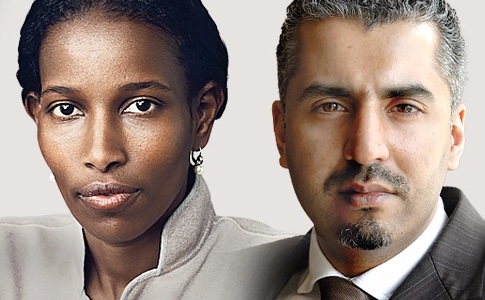 On October 25, 2016 the Southern Poverty Law Center included Maajid Nawaz and Ayaan Hirsi Ali as part of their “Journalist’s Manual: Field Guide to Anti-Muslim Extremists”. Maajid himself is a former member of the Islamist group Hiz ut-Tahrir, having a change of heart after studying civil rights and interacting with Amnesty International, an experience he goes into more detail in his book Radical: My Journey out of Islamist Extremism. He is co-founder of the Quilliam Foundation, the first counter-extremism think tank dedicated to “addressing the unique challenges of citizenship, identity, and belonging in a globalized world. Quilliam stands for religious freedom, equality, human rights and democracy. Maajid frequently speaks on topics related to foreign affairs, Islamic extremism, and is very critical of what he deems as the “Ctrl-Left” on the digital radio show “Leading Britain’s Conversation”. Apparently sharing a “blasphemous” drawing of Muhammad was part of his consideration for being put on the list. You know, what several Charlie Hebdo cartoonists died for two years ago. Ayaan Hirsi Ali is a former Dutch politician, now activist and author of several books including Infidel, Heretic: Why Islam Needs a Reformation Now, Nomad: From Islam to America: A Personal Journey Through the Clash of Civilizations, and The Caged Virgin: An Emancipation Proclamation for Women and Islam. Suffering Islamic indoctrination for years where she was actively taught to hate Jews, that it was haram to wear clothing that might tempt other men and ultimately insult Allah, being forced to undergo female genital mutilation, and going through the assassination of her friend Theo Van Gogh (a list pinned to his corpse with a knife included her name on it) after collaborating with him on the short film Submission, a film that criticizes the treatment of women in Islamic society, it’s little wonder why she might be slightly critical of Islam. Ayaan currently runs the AHA Foundation, a nonprofit organization whose mission statement is “The AHA Foundation works to protect and reinforce the basic rights and freedoms of women and girls, including security and control of their own bodies, access to an education, the ability to work outside the home and control their own income, freedom of expression and association, and the myriad other basic civil rights defined under the laws of Western democracies and the Universal Declaration of Human Rights. The Foundation is opposed to the adoption of dual legal systems to adjudicate family disputes in religious families and supports the separation of all religions and the State.” She frequently speaks out on issues related to female genital mutilation, Islamic extremism, and freedom of speech. She is a fierce critic of much of Western feminism’s refusal to criticize or confront the oppression of women in many Muslim countries. One can only wonder if we’ll reach the day that the SPLC adds themselves to their list of hate crimes. Embarrassment is only possible with people possessing a conscience.